The Messham family was living in Dobs Hill, Pentrobin, Hawarden on the 1881 census. Edward Messham, 32, was a Coal Miner and his wife Mary Ellen, 31 was a Grocer. Their listed children were Martha J. 11, Annie 8, Alfred 6, Edward J. 4, Percy 2 and Mary E was 1 month. The census of 1901 records the family still in Pentrobin, Hawarden. Edward 53 was a coalminer. His wife, Mary Ellen was 51. Their children were listed as follows. Edward James 24, and Percy 22, were both Colliery Fillers. Joseph, 17 was a General Labourer. Hugh, 13, Maud, 11, Gordon, 8 and Stanley, 3 completed the family. There was a Lodger, John Jenkins, 40, a Farm Bailiff. UK, Soldiers Died in the Great War, 1914-1919 accessible on www.ancestry.co.uk confirms his regimental information and tells us that he was born in Hawarden and enlisted in Buckley. His medal card also on ‘Ancestry’ details his medals. 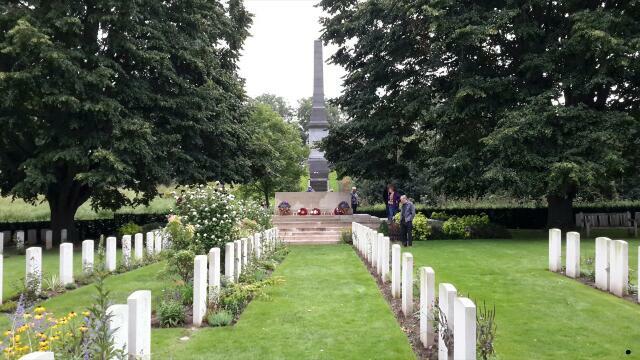 Percy was the elder brother, by 14 years, of Gordon Messham who was killed and is also on this memorial. 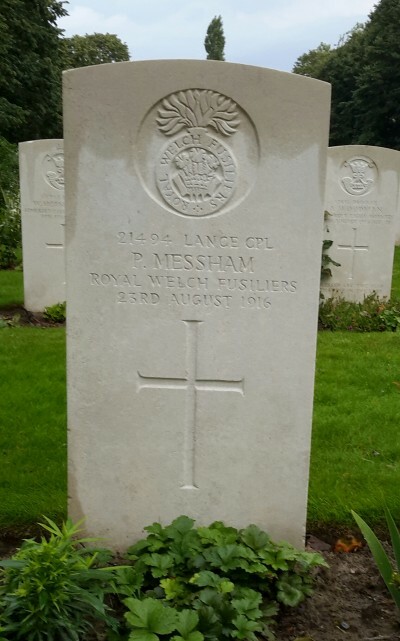 Stanley Messham was another brother who served but who survived. Please see Gordon’s page for more details. . 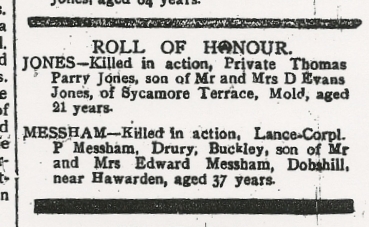 Roll of Honour – MESSHAM – Killed in action, Lance-Corpl. 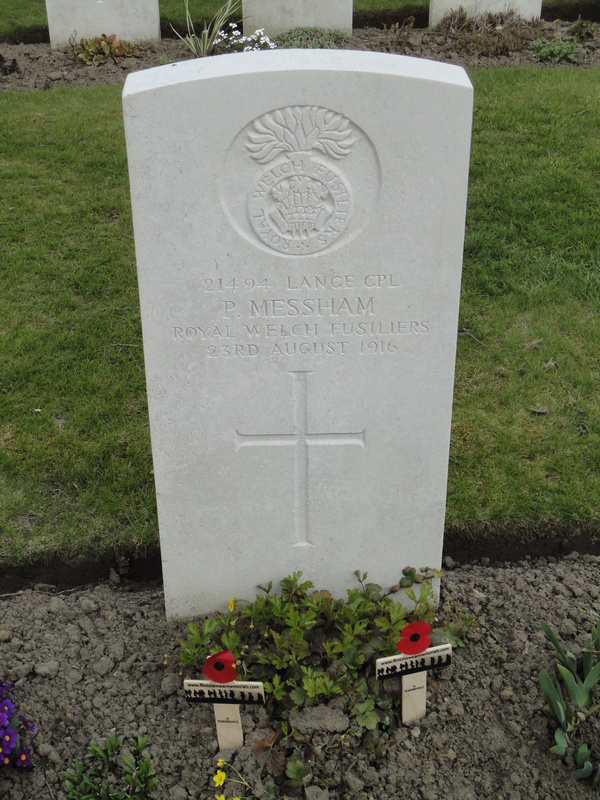 P. Messham, Drury, Buckley, son of Mr. & Mrs. Edward Messham, Dobshill, near Hawarden, aged 37 years. 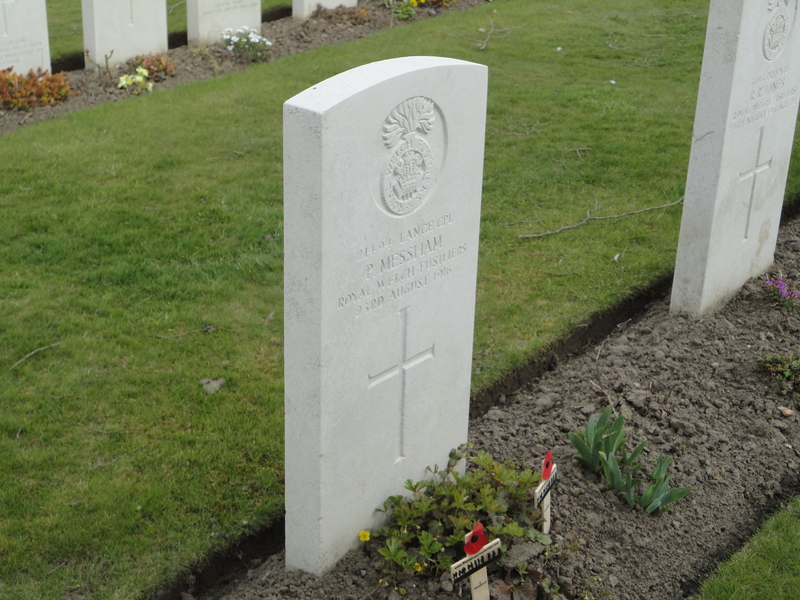 Above is Percy’s grave in Essex Farm Cemetery. 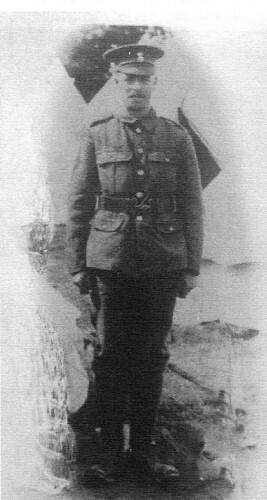 Eifion ànd Viv Williams visited on 15th August 2014, the day before the unveiling of a new Memorial to the Welsh men of WW1. Essex Farm Cemetery was created at the site of a dressing station in the war. The second photograph shows another view of the cemetery. FWM visited Percy’s grave again on the 11th April 2015 and left 2 Flintshirewarmemorial.com crosses.